The posterior pituitary or neurohypophysis or pars neuralis derives as a hollow ventral outgrowth of the diencephalon of the developing brain. Thus, by the fourth week of human development this outgrowth (neurohypophyseal bud or infundibulum) of the diencephalon becomes apparent (Figure 4-1A). At this stage, a hypophyseal pouch, also hollow, evaginates from the stomodeal roof (Figure 4-1A). 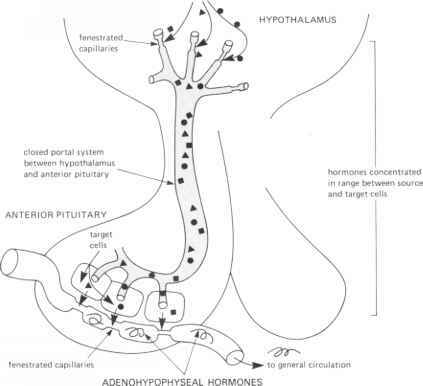 These two outgrowths will form the pituitary, while that of the diencephalon will form the posterior pituitary. By the seventh week, both buds have grown steadily and have come into close contact (Figure 4-1A) with the hypophyseal pouch anterior to the infundibulum. By the eighth week the stalk of the pouch has become solid and begins to deteriorate within the sphenoid bone. The precursor of the posterior pituitary, the outpocket of the brain, remains hollow. Some of the tissue of the hypophyseal pouch encircles the infundibular stalk. The sphenoid bone remodels into the sella turcica, which serves as a receptacle for the gland, and this process is accomplished by the eleventh week. The surface and cross section of the finished gland are shown in Figure 4-1B, as well as its gross anatomical location in adults.